Covering philosophy, humanities and social sciences, science and technology, agriculture, medicine and health care, etc. Articles of CJP stands for the highest level of research in some fields such as mathematics, psychology, archaeology and etc. Covers literature, arts, photography, music, dance, acting and etc. 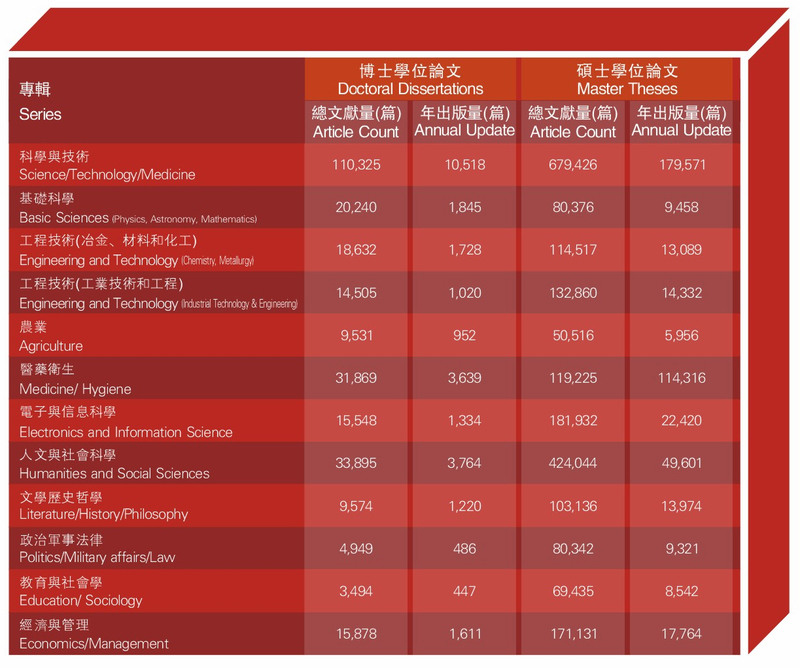 Complete coverage of disseratation/theses from “985 Project” and “211 Project” Universities, Chinese Academy of Sciences, Chinese Academy of Social Sciences, Chinese Academy of Agriculture, State Key Laboratory etc. 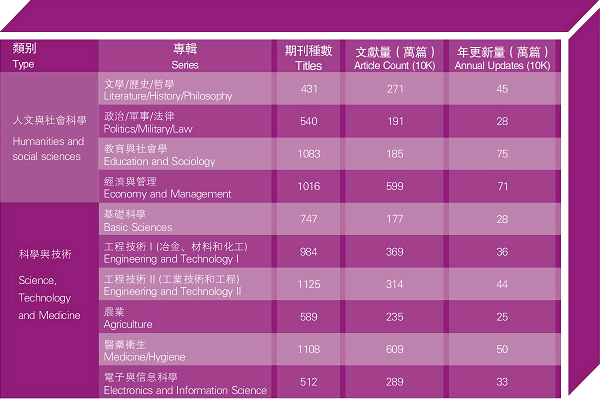 A wide subject range such as philosophy, social science and humanity, natural science and engineering technology, etc. 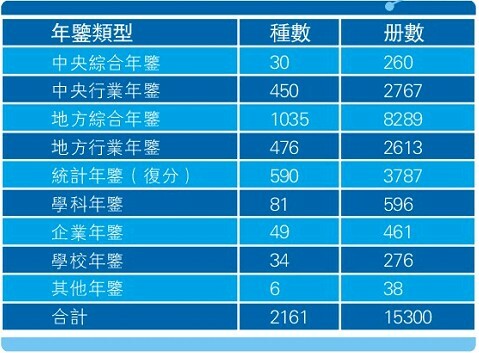 Covering 544 titles of core newspapers officially published in mainland China since year 2000; Article count reaches about 7.8 million so far with a daily update of over 8,000. 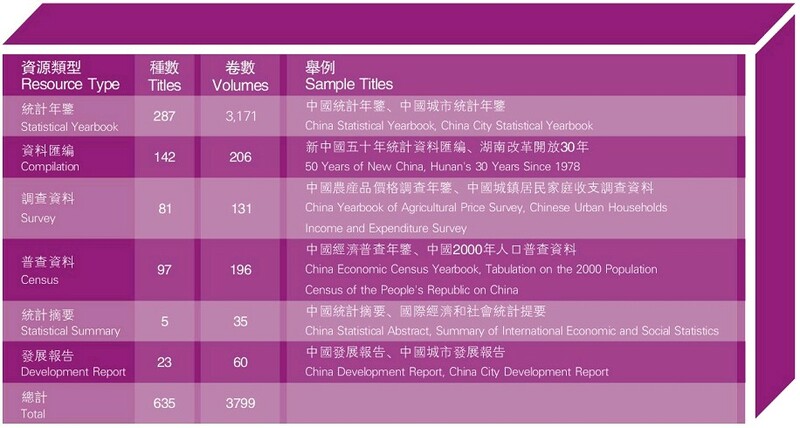 China Conference Proceedings Full-text Database selects proceedings of conferences by universities, research institutes, associations, academic societies at and above second class since 1999. Some important proceedings date back to 1953. Paper count exceeds 1.35 million from 15,000 coferences to date. 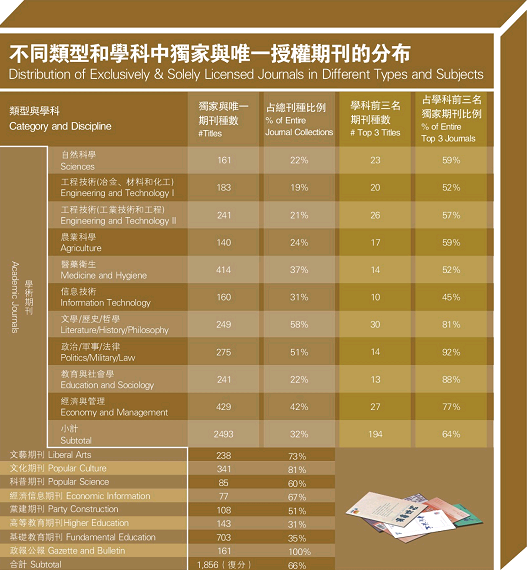 Through copyright licences, proceedings from 1,910 academic societies are only available in CPFD, accounting for more than 80% of all international and national conferences in China. Collected titles are all compiled by experts and published by famous publishers; A precise and authoratative online source for referencing and citation. Correlation linkage to other entries within the same database and other databases including journals, dissertations, proceedings and newspapers; Finding answers to questions aroused during the process of reading at any time. 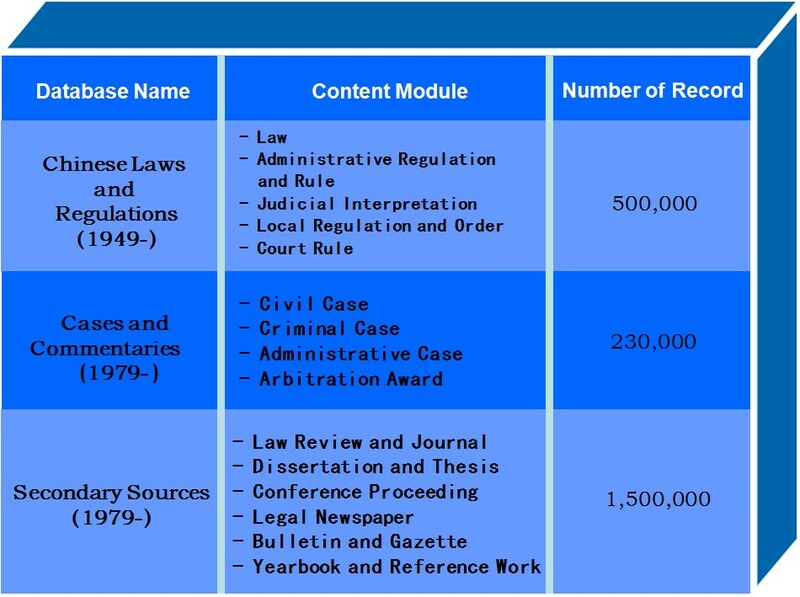 Chinese Legal Knowledge Integrated Database (CLKD) is a portal for legal researchers to find most current and accurate resources on China law. With 7/24 access and excellent customer service, CLKD is a powerful research tool to gather, locate and analyze various types of China legal information. 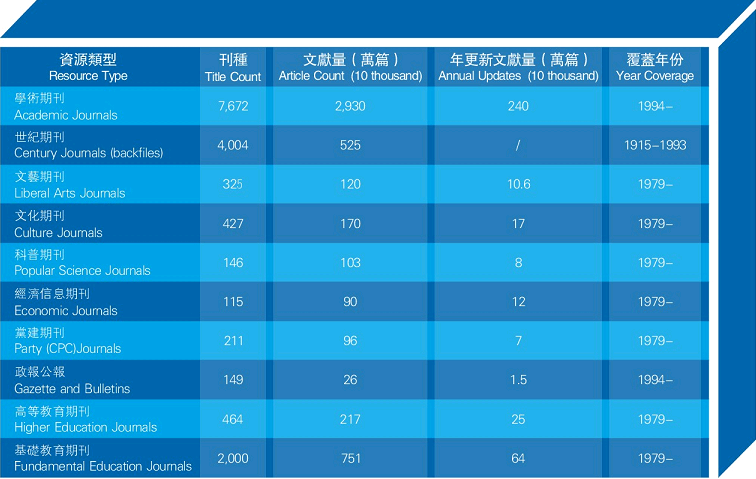 Based on CNKI's sophisticated technology and fully integrated content, CLKD is recognized as the leading Chinese legal research platform worldwide. 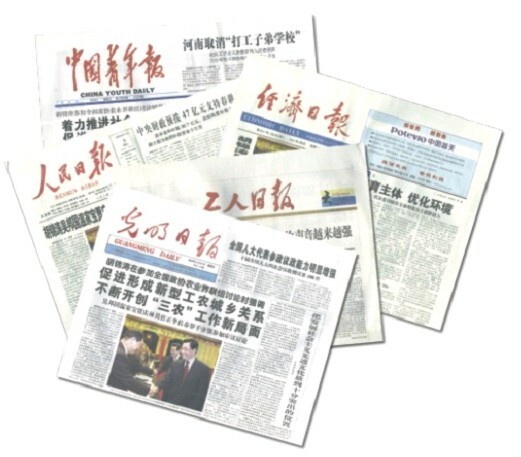 One dedicated system that truly integrates high rated national and local laws and regulations since 1949, law enforcement guidance, case commentaries and judicial opinion and secondary resources for China law research and information updating. 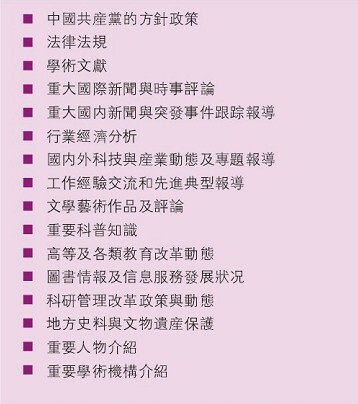 One integrated system to understand and guide China industrial policies, local administration rules and corporate governance on how to do business in China. Also, it provides information on local disputes in the areas like trademark copyright, patent, trade secret and investment regulation. 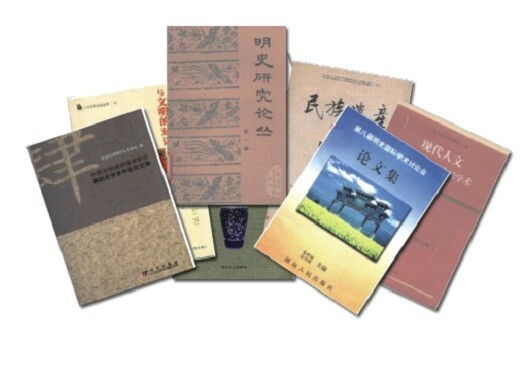 Research tools to analyze the legal, tax and accounting, foreign investment, public policy, civilization and civil rights, environmental protection and other hot topics today in emerging China and equip your research library with huge amount of resources.